With its very attractive, Swiss cottage design the Waltons Honeypot Honeysuckle Wooden Playhouse is one of the most interesting playhouses from Waltons. 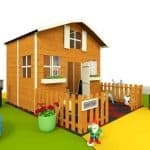 At a size of 6 x 7 it offers the children a whole lot of floor space, but it will not take up the whole garden. The front of the playhouse is just lovely with the veranda roof, large windows and that door with its flower decoration. Inside they will have a generous amount of room to make use of and a whole lot of headroom so they will be able to keep playing inside here even as they grow. As well as making sure the playhouse is officially child safe, Waltons have made sure to only use materials that are going to last many years. 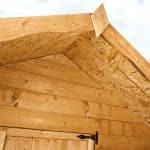 The frame will keep those tongue and groove shiplap cladding walls standing strong and the roof and floor are made with some very impressive solid sheet boarding. So the kids can play safely, anti shatter styrene has been used for the windows and the door has been given a slight gap so their fingers will not get trapped. 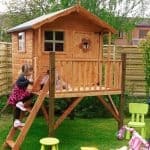 This is just a very well made playhouse that manages to mix style, safety and fun all together in one great package. The child safe and just amazing looking, Waltons Honeypot Honeysuckle Wooden Playhouse is something that wowed us the moment we saw it. With its Swiss cottage design, we are sure you can picture your kids sitting in a chair under that veranda gossiping away to their friend about who is more awesome, Mickey Mouse or Donald Duck. While you can see how attractive the playhouse is the pictures really do not do justice just how floro space there is inside here. 5 feet 7 inches is the width and 3 feet 7 inches is the depth. This is a lot of space to a child and while the first day the floor will look huge and empty, but by day three it will be covered in teddies, action figures and probably a lot of food as well, but that is all part of the fun with a playhouse. 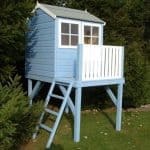 The height of the playhouse is something that took us by surprise as along the ridge there is, 5 feet 7 inches of headroom and even at the eaves there is 3 feet 10 inches so no matter where they are standing, jumping or even dancing there is plenty of headroom. We always love and apex roof that has a veranda and this one really is quite special. Solid sheet boarding is what the roof is made of and we can assure you that even the heaviest blanket of snow will not see it buckle. 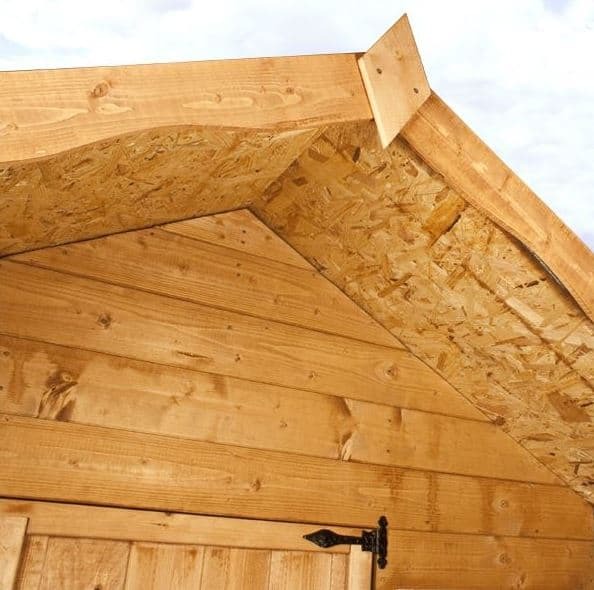 Sand felt is used to protect the boards and the roof is finished off very nicely with a diamond shaped decoration that sits on some very appealing wavy ends. If we do have one criticism it is that you can see the solid sheet boarding under the veranda and we would have liked it if they had covered this up, but still at the end of the day we doubt very much the children will care about this. 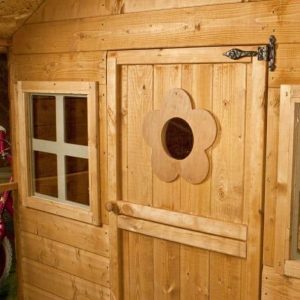 All of the timber that is used for this playhouse has been planed and sanded to give it a very smooth look and also prevent splinters. This smooth look can clearly be seen the moment you look at the 12 mm thick, tongue and groove shiplap cladding. 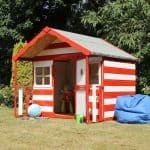 The way the cladding is made gives the playhouse a very solid and tightly put together look and of course as well as being appealing to look at, no rain is going to be able to sneak in through any cracks. While not the most exciting thing to talk about, we must tell you about the frame that keeps this all together. Double framed corners on a 28 mm x 28 mm frame make this one of the strongest frames you can get in a child’s playhouse. It also makes sure that no matter if there’s a bit of rough and tumble, the playhouse will be able to take it. While at a glance the solid sheet boarding which is used for the floor may look exactly the same as the roof, actually it is a couple of inches thicker giving it a bit more strength and stability ensuring that if there is some kind of under 7 breakdancing competition that your child has organised going on in here .Then floor will be able to handle the weight and all the epic dance moves. Seriously though this is a very impressive floor and it will last the whole life of the playhouse. The timber will be given a water based treatment that is meant for short term protection, but they do give you a tub of golden brown wood treatment. This 5 litre tub is a free bonus and it will easily cover the whole playhouse. Treating the playhouse should be done within a week of installation and also once a year to keep the timber rot free. 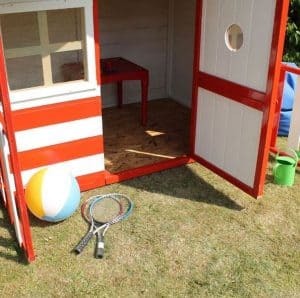 Once you have treated the playhouse it will be covered by a ten year anti rot guarantee. 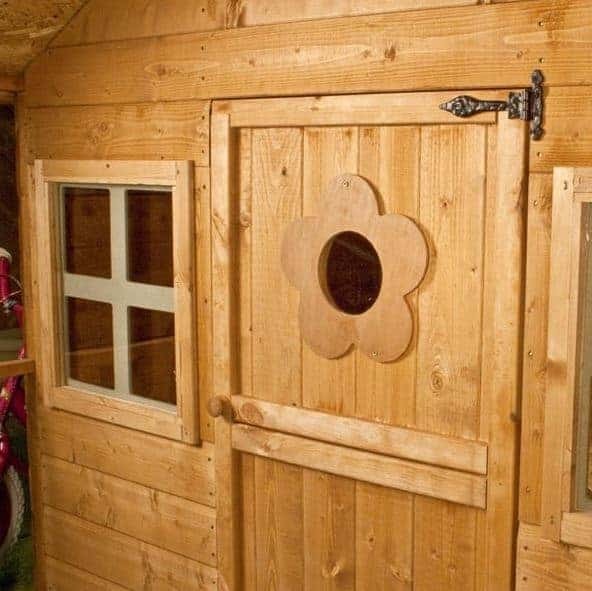 We really like how the door is located right in the middle of the Waltons Honeypot Honeysuckle Wooden Playhouse and how there is this very attractive flower design on it. In the middle of this flower is a styrene window which we really like. Two heavy duty hinges are used to keep the door in its place which is a good thing as Waltons have put a 12 mm gap round the door so that no little fingers can get trapped in it. At 3 feet 5 inches high and 1 foot 11 inches wide, the door is more than big enough for the largest stuffed animal they have to get inside without any hassle, well unless it has been naughty in that case it will have to stay outside. At each side of the door there is a window that is made with strong, 2 mm thick anti shatter styrene. While you may think glass would be a better choice, actually glass and a child’s playhouse are a terrible combination so we are very happy with how they have made these windows. The door will close very securely when they are not playing which is always a good thing, even if you do have to remind them to close it when they have finished playing. There is no lock, but that is not a bad thing to be honest as a lock would stop them being able to come and go as they please. 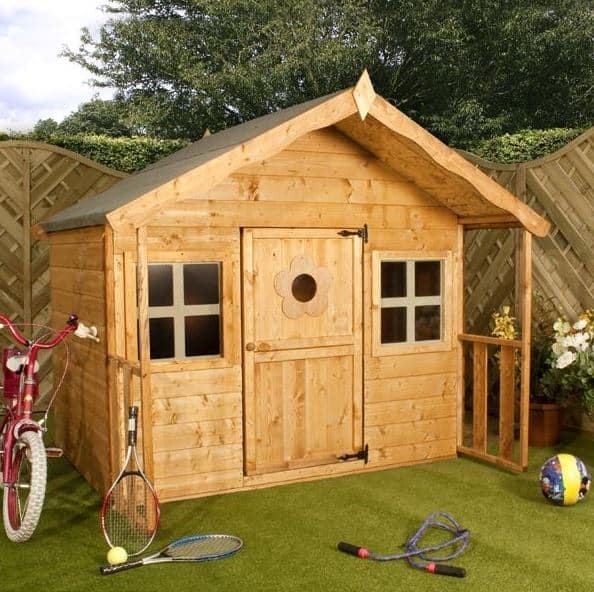 Depending on where you place the playhouse in your garden, this could actually be a rather private little den. As there are only windows on the front it would be easy to place it so they are facing away from the street or the house. However if this is not possible, we feel that some curtains would look great on those windows. 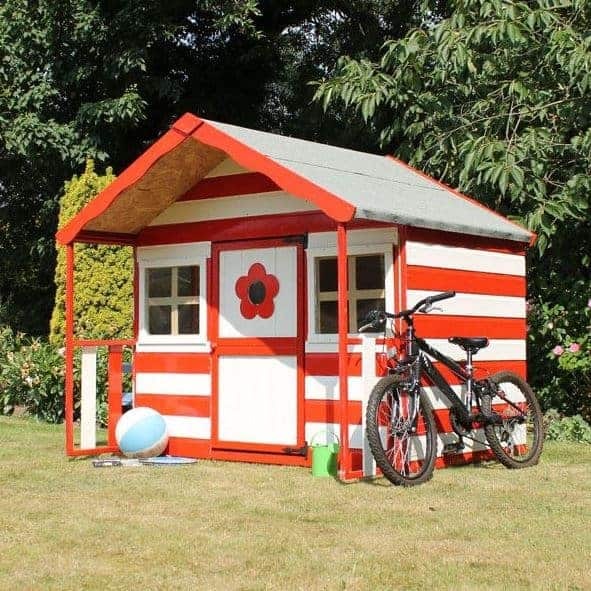 There are no customisation options with this playhouse, but you could always give it a snazzy coating of paint if you wanted to change the look. One of the most popular extras that Waltons have is their wooden kitchen playset. This lets the kids pretend to cook up a meal, wash the dishes and even do some laundry. This is priced at £49.99 which considering it is made of wood is a very fair price. 10 mm olive green superior roofing felt can be added as an upgrade for, £34.99. Waltons also have an installation service where they will build it for you, this can be added for a cost of, £109.99. Even though Waltons are offering this at what we would class as a low price it is still very high quality all throughout. Waltons are masters at selecting materials that will last many years. 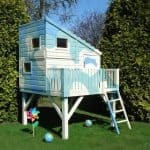 This is the type of playhouse that is so well made, your children will outgrow it before it shows any major signs of wear and tear. While not the larges this is a good shape and offers plenty of room for them to make use of. 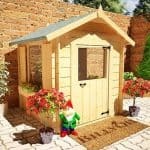 We also feel that for smaller gardens this would be a very good fit. We really do not see you having any major problems that make you want to cry when installing this. Follow the instructions, take you time and this should take you no more than 5 hours at the max. We really love how Waltons have managed to keep the price of this so low which makes it fantastic value for money in our eyes. 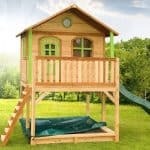 Final Thoughts: We really like the design of the Waltons Honeypot Honeysuckle Wooden Playhouse. While it may lack a slide or some other kind of feature, the charm it has more than makes up for it. Kids will really have a great time as they play in here and the space they have to run around, play games and just be away from mum and dad is going to be something they love. It is very well made and as long as you protect it with wood treatment, then we can see this lasting you many, many years. Then there is the price which at £269.95 is just incredible. 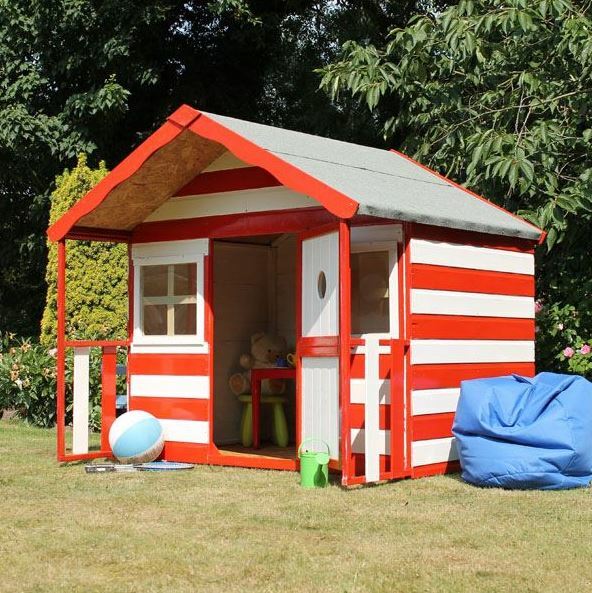 We really do like this playhouse and think it should be one that certainly makes your shortlist when looking for a playhouse for Christmas, a birthday or just as a special treat.